Stay centrally, surrounded by nature, close to the pedestrian area, restaurants, the attractions of the town and LEGOLAND. Architecture, design and a good atmosphere characterise the hotel. Vejle Musikteater, a popular conference and event centre, is just next door. At our hotel in Vejle, you can feel at home in the comfortable and contemporarily furnished rooms with free WiFi, TV and a well-equipped work area. Relax with a cold drink in the hotel bar or enjoy an espresso in the café. 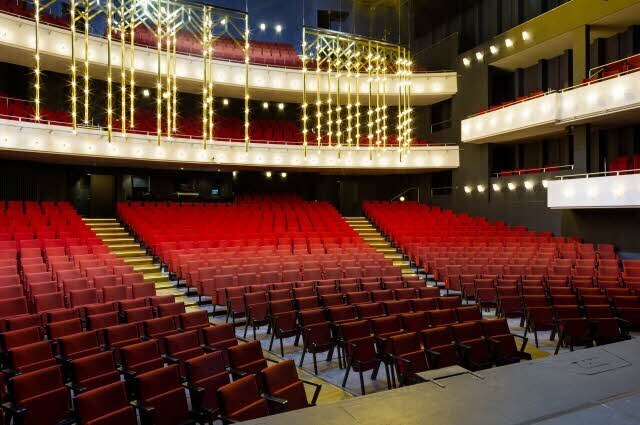 In collaboration with Vejle Musikteater, we can offer professional congresses, conferences and events for up to 1100 people. The central location of the hotel also enables us to organise exciting activities in Vejle Bypark. Our bright gym with modern exercise equipment is available all day long and here you can enjoy the view of the town. After a long day, we recommend a visit to our sauna. Stay surrounded by natural beauty, close to Vejle town centre with shops, restaurants, and attractions such as Vejle Art Museum, and not far from the hotel, you will find Legoland. We offer Fast-track and/or discounts for the largest attractions in Vejle and its surroundings, including Legoland – an added bonus when you stay with us. About 30 km from our hotel, you will find Vejle Golf Club with its 27 holes and one of the most beautiful golf courses in the country. You are also welcome to borrow a bicycle from the reception and explore Vejle. If you need to get to and from the hotel, the train station is 5 minutes’ walk away, the motorway 4 km away and Billund Airport 30 km away. When you stay or hold a meeting with us, we advise you to use the Albert multi-storey car park next to our hotel. At hotel Scandic Jacob Gade we offer 9 modern and well-equipped conference and group venues for 2 to 1100 participants.